Finely chop the onion and set aside, should yield approximately 1 cup. Thinly slice scallions including greens and set aside separately from the onions. Heat 1 Tbsp. oil in a large stock pot over medium heat. Add ground turkey and brown, breaking up the meat with a large spoon as it cooks, approximately 8 minutes. Once turkey is completely cooked, remove from pot to a bowl. Heat remaining 1 Tbsp. oil in a large stock pot over medium heat. Add onions (not scallions) and saute until tender, approximately 5 minutes. Add cornmeal and stir with a whisk and cook for 2 minutes. Drain and rinse beans. Add beans to the onions. Add stock, cover, and bring to a boil. Uncover and simmer for 5 minutes. Juice lime and add lime juice to the chili. Return cooked turkey to the pot, add hot sauce, salt, and pepper. Taste and adjust seasonings as needed. 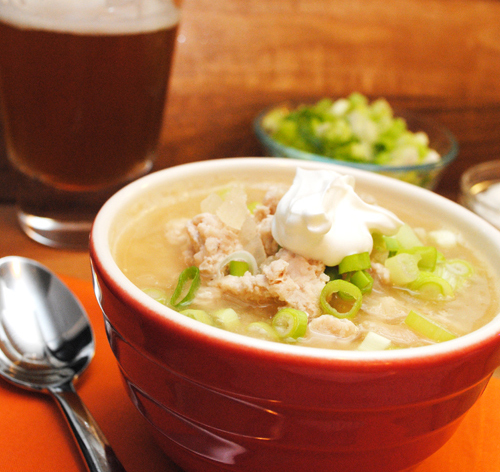 Ladle soup into bowls and top with scallions and sour cream. Serve with homemade Cornbread if desired.